Change is a constant part of life. Recently, I was reminded of this when my girlfriend Claire, our dog Elton, and I started living the Airstream life. Thanks in no small part to Sunset, our little family made a big lifestyle adjustment we never knew we wanted, and now every day is new and exciting inside our humble Airstream. We wanted to take this time to celebrate the changing of the seasons, too, but winter in Southern California typically means going from upper 70s to low 70s. (It’s a rough life, but someone’s got to live it!) To honor this season, we decided to update the interior of our 2014 International Signature series 23D Airstream. Transforming the factory-designed interior to something far more cozy was no easy feat, especially with only 160 square feet of space to work with. The outcome, however, is a glorious combination of rustic cabin meets lumberjack sipping on whiskey. THE BEDROOM: Our Pendleton blanket bedding and pillow. A dreamcatcher over the window. THE KITCHEN: Where we keep our Le Creuset pots. 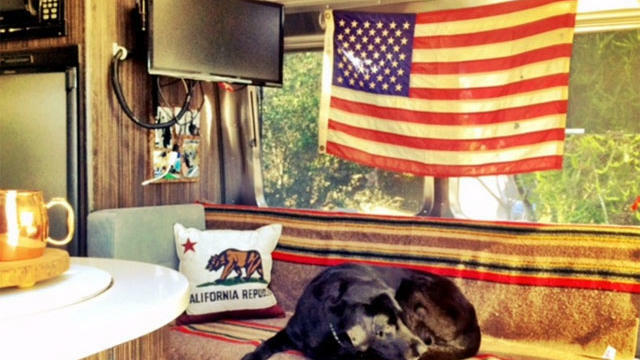 THE LIVING ROOM: One of our favorite spots in the Airstream. Utilizing small space: With less space in our Airstream than a normal home, we worked around our built-in furniture by using pillows and blankets to make our mobile home more like a cabin getaway. Our signature piece(s): A vintage (and authentic) American flag in the back room of a local Ace hardware store and a Pendleton blanket. Other accessories: Circular pine wood trays and chunky wood blocks. Our favorite accessory, Elton, our lab, goes with everything. We created a video journal to show how all of this came together. Let us know what you think about our style choices! For more, check out our Airstream on our blog at http://www.airconcierge.net/blog.